Poll results: Is the Samsung Galaxy Note5 worth $300 more than the Moto X Pure? Last week, we pitted a couple of unlikely competitors against each other: the Samsung Galaxy Note5 and the Motorola Moto X Pure/Style. We had no delusions that the Note5 was the better all around phone; it is the peak of top-of-the-line phones after all. But even so, we wanted to know if the benefits of the Samsung Galaxy Note5 really added enough value to make the device worth paying an extra $300 over the cost of the the Moto X Pure. It turns out that for the majority of you, the answer was no. The Note5 may be the better phone, but 58% of you said that a $699 outright price was not worth the performance improvements offered by the Note5. On the other side, 35% said that the overall better specs as well as software and hardware additions of the Note5 did make the device worth the extra $300. The final 7% of respondents didn't much care about the question either way, because they had no intention of buying an Android device, or a device at the full upfront cost. Of course, as with Apple devices, Samsung devices can carry a higher cost simply to make up for the millions and millions of dollars the company spends on marketing as well as more interesting endeavors like the curved displays of the Edge devices. But, if you just want a solid device at a reasonable price, most of you said the Moto X Pure/Style is the better buy. That said, we're still pretty sure that the Note5 will far outsell the Moto X anyway. 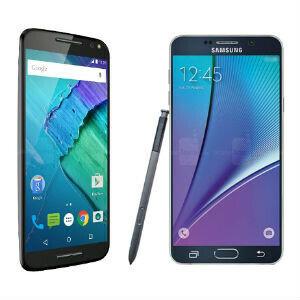 Is the Samsung Galaxy Note5 worth $300 more than the Moto X Pure? Funny, I remember people saying Motorola will f**ked up when it sold to China http://www.phonearena.com/news/Poll-results-Lenovo-acquires-Motorola.-Are-you-excited-about-what-the-duo-can-bring-to-the-market_id52120 looks like motorola made a better phone without American google!!! Did you even read the article how the situation of Motorola and Lenovo are? The duo hardly earns profit compared to previous year. The only thing that makes them look attractive to consumers is its dirty-cheap price, other things like camera quality, battery life and practical experience are way far behind Samsung Galaxy and LG G series. If there's no American's Google, Lenovo will not what it is here today. Stop being an anti-America head, you better shift revenge to red evil sun. Wow, amazing. Same person with two account talking as if different person. Ha ha ha. You must lead a truly pathetic life to do this. LoL. The only person who has a pathetic life is you. I usually saw you bashed almost in every Samsung articles especially the quarterly reports ones. Nowhere to hide itroll, huh? Go give BobbyBuster some foot massage. Of course you really think a device with midrange like specs can compete with a beast like specs? You apparently think they can. "I have already decided to purchase a Style", your words, not mine. That's really ironic coming from you. Don't you think the iPhone can compete with the Note 5? Of course it can. Both run circles around the Passport. Considering that you've never even used a Passport before, there is no way that you can accurately say that, so you're lying. But that's the norm for you. Leaving your mark in blackberry articles is the norm for you. Leaving your mark in your "tighty whiteys" is the norm for you. Bring back MicroSD slot (with 64GB built-in),a 3900mAh battery, and allow more apps in RAM , Samsung, and only then will it be worth the $300 more. And don't forget to update tw on Note 4, i think Android M should carry this update. I heard Moto is quite good when it comes to update. And Waterproofing, Stereo Speakers, Metal unibody with a removable battery - making it a perfect phone. Alas, it cant still outsell an iPhone in spite of being already better than it. Flame wars here you go. Bring it on!!!!! there were rumors that s7 will have sd card slots...so i think note 6 will also have that (most probably) & samsung is (or has already started) mass producing 6 gb ram for mobiles.. so i think note 6 may have both....dont know about battery though. It won't, don't spread false rumors. And don't forget the IR Blaster and possibly removeable battery, but not desperate for the latter if it has long battery life. If 35% prefers to buy Note 5, I think it meets the target segment. So what's the point of this poll seriously? I can explain where the 300$ goes: +SuperAMOLED +Super Exynos 7420 (which is superior to 808) +4GB of DDR4 vs 3GB DDR3 RAM +More advanced 16 (with OIS), better overall quality +UFS 2.0 +Fingerprint scanner +Heart rate sensor +Wireless charging Now I wonder if PA is on Motorola payroll recently! The point is to ask people whether those things are worth $300 to them. Of those things the only two I'd be willing to pay more money for would be the Fingerprint scanner and the extra GB of memory. You can ask the same question whenever a new product is released, users justify using outdated products because they don't see any value in current technology. But that won't stop technology advancing and progress being made which gives us new features and faster phones. It's basically the default argument for when you really don't have one. For me it's more about future-proofing the device, so that I don't have to buy another device as soon. For example, I don't use mobile pay now, but I want to have a fingerprint scanner for that or maybe some other use in the future. Screen type/resolution, doesn't really affect future-proofing. I don't care if there are other better screens out there, and would actually be willing to opt for a lesser screen that uses less power. Please read the original poll article before trolling. Thanks! A good share of negative votes are because of the disgust people have against Samsung for removing the micro sd card and lowering the battery capacity. Unlike Apple, Android users have choices and are more tied to the OS than the phone brand. I don't think he's trolling. Just that the Note offers more in terms of specs and features while the X just feels so modest.